Production of Pochonia spp. in laboratory conditions has facilitated studies on its biology, abundance, dispersion, rhizosphere colonization, host preference, and isolate virulence. Research in biological control of nematodes requires suitable, standardized methods. In this chapter we review the commonest, non-molecular, standard in vitro culture methods to isolate, screen, and select isolates, some of which may eventually be produced on a larger scale for application in combination with other management strategies for plant-parasitic nematodes. Kerry, B. R. (1997). 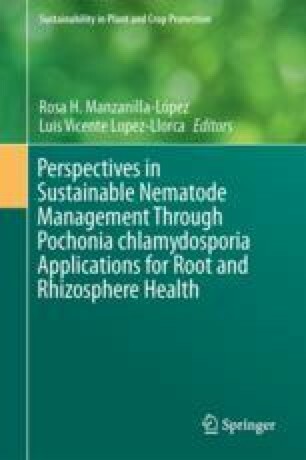 Biological control of nematodes: Prospects and opportunities. FAO corporate document repository. Plant nematode problems and their control in the near east region. FAO plant production and Protection paper, 144. http://www.fao.org/docrep/v9978e/v9978e00.HTM. Accessed 14 Oct 2016.